After two impressive road wins, Midland-Odessa FC is now top of the table in the NPSL South Conference-Lone Star Division. The Sockers scored three second half goals in the space of 11 minutes to defeat the Kings 3-0 Thursday night in Tyler. Memo Diaz scored the opener in the 55th and Zach Penner followed immediately 3 minutes later to make it 2-0. Both goals were assisted by Jamie O’Grady. Elliott Bentley finished off the scoring in the 65th minute. Earlier this week Sergio Gonzalez was named the Tyler FC Player of the Month for May. “Sergio has been our most consistent attacker… Sergio is usually the first one to arrive to training and he lives further away than most guys on the team…” Says President and Head Coach Chris Avila. He also mentions that ” Sergio is focused and his work ethic is admirable. I expect big things for Sergio on and off the field because of the person he is.” Sergio Gonzalez is a quiet and humble kid who is always ready to play soccer! Dallas City FC posted a notice on its Facebook page June 9 that announced, due to weather, that the Saturday game has been postponed. 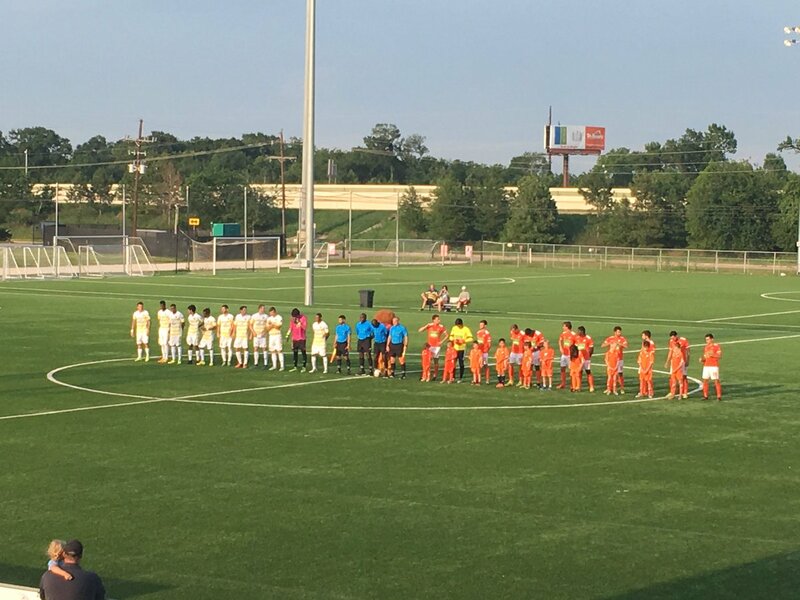 Three second half Dutch Lions FC goals offset the 26th minute opener by the Vaqueros Hilton Ngwa to win in Conroe last night. Midfielder Jerry Scholman scored in the 49th minute and then put the game away when he scored in the 79th. 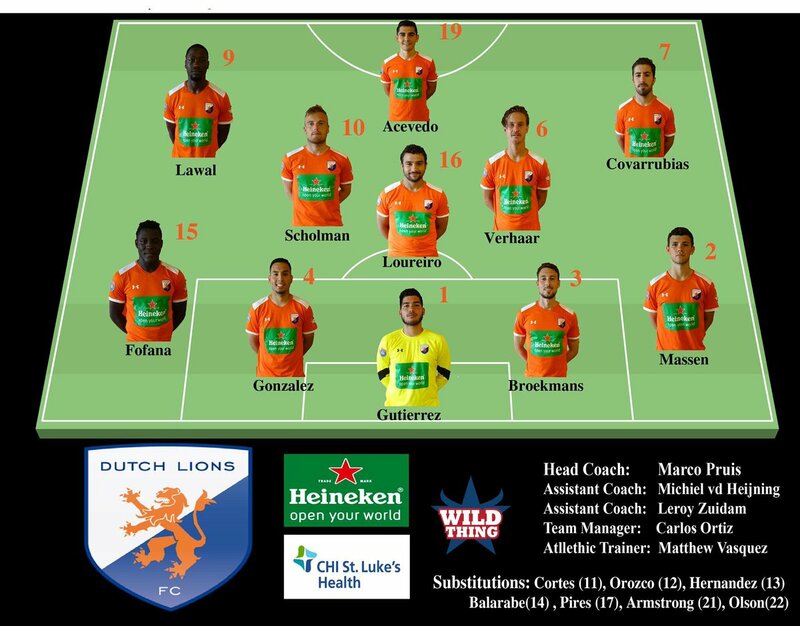 The other Dutch Lions goal was scored by forward Jose Pablo Covarrubias on a penalty. The Dutch Lions dominated the second half and almost scored twice right after the break, before breaking through on Scholman’s first. “This was a tough loss. We came out strong and controlled the game in the first half,” Vaqueros assistant Greer Chavez said. “Glad to see Hilton Ngwa get on the scoresheet. They started faster in the second half and we just made too many mistakes in the back. We had chances throughout the game but couldn’t put them away. Behind a brace by Diego De la Cruz and a goal from Hector Balandran Regals SCA shutout Tyler FC at KIPP High School stadium in Houston. The Sockers won the second away game of the week, despite playing shorthanded for close to a half hour, when they defeated the Rafters 2-1 in Shreveport last night. Zach Penner, after picking up two yellow cards in a little more than 10 minutes, was sent off in the 63 minute, with the Sockers leading 1-0 at the time off a James O’Grady 21st minute goal. The Rafters leveled the game when an unfortunate 72nd minute goalkeeper clearance hit a Sockers player and created an easy opportunity for the Rafters. Despite the challenge, the Sockers were fortunate to get the game winner in the 87th minute when Midland capitalized on a direct kick opportunity and Hamish Ritchie broke the deadlock.